‘I’m the Man Who Loves You’ is the eighth song on Wilco’s 2002 album Yankee Hotel Foxtrot. It, ‘Heavy Metal Drummer’, and ‘I Am Trying to Break Your Heart’ are the songs from that album that I’ve been listening to for the longest time. There was something about those three on first listen that just grabbed me for whatever reason. ‘I’m the Man’ is probably the most relaxed out of them, though begins with an erratic guitar freak-out by Jeff Tweedy that gets things off to an unsteady start before eventually switching into a chilled acoustic number. The song’s name is sung at the end of ‘I Am Trying to Break Your Heart’ so you may think that it would be some sort of centerpiece of the album. I certainly did at first. Maybe it is but I’ve never noticed how. To me it’s just another great song on there. Generally, it’s about Tweedy’s (or anyone’s) inability to express their love for someone. The lyrics describe a narrator trying to write a love-letter and failing at it. Though they wish they could express themselves to their fullest, they know that sometimes it can take a simple action to let their significant other know how much they care for them. Like holding their hand, for example. Like I said earlier, there’s a very laidback and brisk quality to the track. As it progresses there are little flourishes added here and there that prevent the track from falling into a lull. Little keyboard presses on the left channel, ‘ooh-ooh’ backing vocals and then the magnificent horn section that suddenly appears during the last verse and stay for the track’s long outro. It would be during the final minute and ten seconds that a producer would decide to fade it out but it rather comically comes to an abrupt halt with the drums coming to a sudden stop and the lead guitar doing whatever it pleases. Seems as if they didn’t really know how to close things out. Still makes for some great listening. I regarded ‘I’m the Man’ as one of the more ‘radio-friendly’ tracks from that album in a post back in 2015. Upon more frequent listens of the album I’ve realised that there are a few other songs on there that you would be more likely to hear on your station. Not that that’s important in any way…. I just had time to listen to the album closely to really appreciate other tracks on there. Check out Yankee Hotel Foxtrot everyone. The Beatles went to Rishikesh in India in order to rediscover who they were as individuals and as a group in February 1968. Over there they wrote a large number of songs; the majority of them were released on their self-titled album later on in the year. One of them was today’s subject ‘I’m So Tired’, written by John Lennon who was suffering from bouts of insomnia whilst pining for Yoko Ono. jovial in spirit. ‘I’m So Tired’ is a slow burner in comparison, one that grows in intensity from verse to chorus via its apt instrumentation and probably Lennon’s best vocal takes on the whole album. It’s very passionate but also very pained in its expression. A lot of John’s most powerful Beatles lead vocal performances are on the White album, thinking about it. He could turn a winding meandering vocal into a shout of pure frustration at the drop of a hat. Very much like he does here. It lasts for only two minutes but it has substance. It has been said and verified by many that John Lennon liked to sleep. When the Beatles took their rare breaks during their constant touring schedule, Lennon would take the time reading, writing, and sleeping – usually whilst under the influence of drugs. Paul McCartney would have to wake him up so they could get their songwriting sessions started. ‘I’m Only Sleeping’ is his dreamy ode to the activity…. and the lack of physical activity in general. The song is the third on the band’s 1966 album Revolver. My personal favourite. Considered their best work by some. The track is driven by hazy acoustic guitars played by both Lennon and George Harrison, McCartney does his thing on the bass as usual, and a great emphasis is placed on the cymbals of Ringo Starr’s drum to further enhance the misty soundscape. One notable highlight is the backward electric guitar part that Harrison reportedly wrote and then recorded in an intense five hour session. Now it’s standard practice to put backwards music in a song to jazz things up, I can only imagine that in the 60s it must have really blown some people’s minds. Or at least made them question what was going on. It’s a very cliché thing to say, but I seem to hear new things almost every time this song comes on. Lennon does a little hum just as the guitar solo is ending, John tells Paul to yawn before he does so in the little break, there’s a little guitar whine during the ‘lying there and staring at the ceiling line’…. there’s a lot of stuff to uncover! Makes it the more interesting to listen to. Three out of the four albums The Who released in the 70s contained songs that featured only Pete Townshend, John Entwistle and Keith Moon performing with lead singer Roger Daltrey possibly absent from the recording session. ‘Going Mobile’ (Who’s Next, 1970), today’s song ‘I’m One’ from 1973’s Quadrophenia, and ‘However Much I Booze’ (The Who By Numbers, 1975) are where the band essentially becomes a power trio; even without Daltrey’s powerful vocals the three remaining members still kick up a storm, seemingly without any sign of struggle. To anyone who hasn’t heard Quadrophenia, do it now! What are you doing? Sorry. It’s a bit difficult to try and explain tracks from there without having to recap its story so far. It’s a rock opera. Basically, it is about a youth called Jimmy who has four split personalities – with each one representing a member of The Who – who has problems with his parents, relationships, the mod scene he desperately wants to be a part of, and himself in general. Though it’s much more better actually hearing it for yourself. ‘I’m One’ is the sixth track on the album, coming after a point where Jimmy has left home feeling misunderstood by his parents, tries to become a mod by having the right haircut, and sees The Who in concert but leaves disenchanted by the whole affair. Things aren’t going to well for him but at least he’s someone in his own eyes. Quite ironic in that really he’s four people sort of, but at least he’s trying to figure himself out. Townshend, Entwistle and Moon kill their respective performances here. Starting off slow with reverberated acoustic guitar and Townshend’s shimmering lead vocal, everything turns on its head about 50 seconds in when Moon’s drum fill comes in and introduces Townshend’s electric guitar and Entwistle’s bass into the frame. It is more or less agreed that John Entwistle was one of the best rock bassists – if not, the best – to have ever existed, able to play such complex lines at an alarming rate. On this track, he plays his bass quite straight. As straight as it could be if you were him. Keith Moon’s drums propel the song to another level with emphatic drum rolls and cymbal crashes. It’s a determined and very forward-moving two and a half minutes of music and one of my personal highlights from the album. Cloud Nothings’ album Here and Nowhere Else turned five years old a couple of weeks ago. It still packs as much of a punch today as I thought it did then. At the time it was an album that I needed. I had found myself listening to the same old songs for too long. I was very much into Pitchfork so when the site gave it an 8.7 rating out of 10, it was clearly obvious that this album was going to be good. A word you could use to describe the album is ‘rough’. Not in the “yeesh, that’s rough” kind of way. More in its aesthetic. The pounding drums go about a few seconds earlier than each guitar strum. Dylan Baldi’s vocals are never that clear in the mix. The guitars have quite a harsh, sandy quality to them. But every track is melodic and grounded in pop sensibilities. I may have already stated all of this in the linked post but it’s always good to recollect. ‘I’m Not Part of Me’ is the album closer. From what I can remember it was the first taste of the then new album that the band unveiled to the public too. It arguably has the most memorable hook on the entire record. Plus, it’s quite optimistic in its own casual way. Here and Nowhere Else is quite a tense record musically. Lyrically it looks at the the unfairness of life and how sometimes we just have to deal with bad things that happen to us. Then ‘I’m Not Part of Me’ comes in as the last track and provides the idea that life is unfair, yes, but that’s okay – you just have to move on. It’s almost a breath of fresh air. Just almost. Rubber Soul was The Beatles’ sixth album overall; it was also the second of two albums by the group released in 1965 with Help! arriving in stores only a few months earlier. Rubber is usually seen as the point where the four lads deviated from their love-centric light-hearted pop hits and began making music that required attentive listening. Their aim was to make an album which flowed, had direction, and where all songs that were listed were important to its structure. They succeeded. This was the look of a band with confidence. 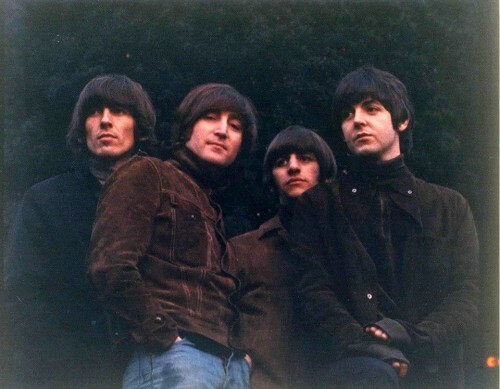 Another Beatles song beginning with “I” or “I’m”, ‘I’m Looking Through You’ is the tenth track on Rubber Soul. Paul McCartney wrote it. It seems that he was going through some relationship troubles during this time in The Beatles. He and Jane Asher had been an item since 1963. She was a successful actress in her own right though McCartney wished she was at home a lot more of the time. During the making of Rubber, he wrote this track, ‘We Can Work It Out’, and ‘You Won’t See Me’ – all of which were about his frustration with the whole situation. Out of the three, ‘I’m Looking Through You’ is the most brisk. It’s very acoustic driven and moved by some knee-slapping percussion and active bass playing. I think it’s notable that it mirrors ‘You Won’t See Me’ in that both tracks concern a sense of disappearance. Musically, you can say it’s upbeat. Has a major key throughout, the somewhat jubilant electric guitar lead and keyboard vamps in the instrumental breaks add to its somewhat cheerful demeanour. The lyrics are a real downer though. Another case of ‘happy music with sad lyrics’ in the musical history books. Sorry to just dismiss it as that. It is that dynamic between the music and lyrics that make it another thoroughly enjoyable song in the Beatles catalogue. You can’t go wrong with Rubber Soul. Below is another take of the track that was worked on but ultimately discarded. It’s a lot slower but still has the same emotional impact. ‘I’m Just a Killer for Your Love’ is the tenth track on Blur’s self-titled album, released in 1997. For anyone who owns that album and holds it in particular high regard, it’s not hard to notice the slight quality difference in terms of production between this track and all the other 13 songs it’s placed alongside. It has an almost monoaural mix compared to the somewhat expansive sounds in ‘Beetlebum‘ or ‘Death of a Party‘, it sounds like the recording was accidentally started after Dave Rowntree starts drumming, there’s a Beatles ‘Yer Blues‘ feel to it in that it sounds like the band are just in this one room close together busting this thing out. Well, there’s a reason for this. It’s the only song on there not to be produced by Stephen Street. Apparently, it was the very last track that the band worked on for the album and something the four members knocked out whilst working in Damon Albarn’s then new ‘Studio 13’. The track is very loose, rough around the edges, very slack in its execution but oddly seductive too. This song predates Gorillaz’s first album by a few years but there are a number of things about it that remind me of what would appear on that project’s 2001 debut. The lyrics are a number of surreal images that when put together appear to make a coherent story, Albarn’s played up (or toned down, however you see it) vocal delivery is something he would go on to develop and play with more with the project, and just in general it’s almost experimental in its weird way. Pay attention to Alex James really forcing that wah-wah effect on his bass, that’s some good stuff.